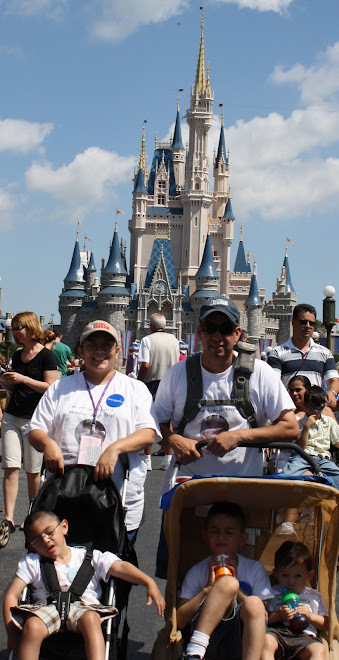 ok, so here is the post about the most AMAZING place in the world ESPECIALLY CREATED for these special kids and their familys.....click HERE for the LINK to the website. well, i wanted to devote a whole post about this wonderful place so MAYBE you can understand what an AMAZING place it is and WHY this MAKE-A-WISH trip was so special. this amazing place was built and created by Henri Landwirth, who is a HERO to MANY people....he has founded MANY different organizations all to help PEOPLE!! he is a HOLOCAUST SURVIVOR....which is just amazing...and he wrote a BOOK about his life story....the short story of GKTW is HERE...the short of it is that a child asked a hotel owner if she could stay at his hotel while she went to the florida area attraction....he said yes but it took to long for that "wish" to come and the child ended up dying....he swore that that would not happen again...so in 1989 GKTW OPENED to special families...."He called the project “Give Kids The World,” because that is just what he intended to do - provide memorable, magical, cost-free experiences to children with life-threatening illnesses and their families"...and HE DOES!!! 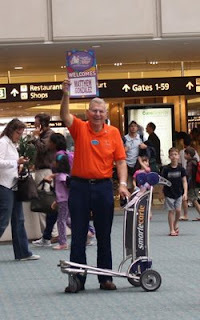 first, they send a GREETER to the airport to make sure you know they are waiting for you!! AND he helps you get your luggage, get your vehicle and sends you on your WAY!! AND THIS is what you see when you pull up to the VILLAGE!!! doesn't it make your HEART RACE?! we were sooooooo excited! here is a TOUR of our HOME!! where they have a HOT meal for you and you sit at tables fit for kiddos and each table has HUNDREDS of those STAR PEPPERMENT MINTS inlaid in them...all on the top they have THOUSANDS of dolls and toys that have been donated to GKTW....and then let me tell you about the staff of ANGELS that they have....they are ALL VOLUNTEERS from all walks of life, young, old....many of them work at DISNEY parks and UNIVERSAL STUDIOS....from church groups, corporations, etc....and ALL SO HAPPY TO BE THERE and they treat the families like ROYALTY....so nice, giving, warm, loving....we pick our food off the buffet and then the volunteers carry your tray for you, and get you whatever you need!! so amazing and nice!! we kept getting all sentimental during this whole process which sometimes made eating hard with that lump in your throat... and GOD FORBID you start to clean your table and stack dishes because they are WATCHING and they will swoop down and tell you NOT TO TOUCH THAT...that that is what they are there for....OMG...SO NICE!!! 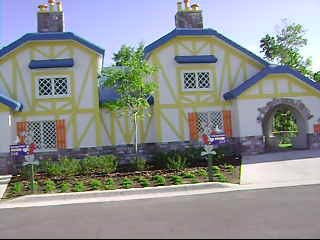 and you can also play PUTT PUTT GOLF there all the time if you want!! there is also a little train that goes around the putt putt area that you can ride whenever you want and as many time as you want!! sooooo much to do!! there is also the AMBERVILLE where there is all the above and there is also an arcade and COOL TRAIN VILLAGE that you can push the button and things start to move in the village!!! and i understand that someone comes EVERY WEEK to CHANGE the village around!! just AMAZING!!! here is alex driving one of those BOATS in the water below!!! here is joshua just LOVING watching the trains go by and pushing the buttons!!! sooo, as i was saying this place is AMAZING....they actually added another playground called......MATTHEW'S BOUNDLESS PLAYGROUND! AND OF COURSE, i can't find a PICTURE that we took of it but it is based on the CANDYLAND BOARD GAME!!! it is just AMAZING and accessible by wheelchair thru out!!! just amazing!!! and it was right down the street from us!!! soooo, see, this BEAUTIFUL VILLAGE is amazing....and to think that it was ESPECIALLY made for SPECIAL NEEDS FAMILIES LIKE US!!!! it brings tears to my eyes EVERYTIME!!! SOOO, i will have to DEFINETLY try to make sure that i let the WORLD know, or at least all those that read this blog and my friends and family that there is a WORTHY CAUSE if anyone can donate to...this place is amazing and my family is LIVING PROOF that DREAMS DO COME TRUE and that this place is MAGICAL for families like ours....any donations that can be made to this place would be WELCOMED and hearing our story of our WEEK IN PARADISE will give proof that your DONATION would be working and would be shared with other families just like MATTHEW'S!!! I will also do a post later on about the MAKE A WISH FOUNDATION!!! so be on the look out for that one too!!! Oh Maria, it looks like you had an absolutely amazing time! I'm so happy for all of you!